The Daily Caller has unearthed a chilling new video from Planned Parenthood founder Margaret Sanger. British Pathé, a newsreel archive company, uploaded 85,000 historic films onto YouTube. 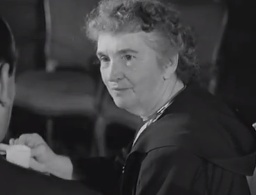 One of those films featured Margaret Sanger, called Margaret Slee (her second husband’s name) in the video, demanding that women have no more babies. When questioned about women who want babies and in 10 years won’t be able to have them, Sanger insists that it is somehow practical and humane to not allow them to have children. Considering that 96% of pregnant women who go to Planned Parenthood abort their children, Sanger clearly got her wish. It isn’t particularly surprising that Sanger would strongly advocate for abortion. We already know that she was a proponent of eugenics, and didn’t want to allow “undesirables” to breed. But this puts her into an entirely new, and even more sickening, light. Sanger didn’t just want abortion. She didn’t want any women having babies, period, regardless of how they felt about it. And that attitude has quite obviously trickled down into the pro-abortion movement today. How often do abortion activists fight against any semblance of choice? They don’t want pregnant women to have the option of going to a crisis pregnancy center to help them through an unexpected pregnancy. They don’t want them being given the option of adoption, or being told the truth of fetal development and embryology. They don’t want ultrasounds before abortions, or anything really that could possibly sway her away from having an abortion. Women’s health? Please. This video, and Planned Parenthood’s own annual report, says it all. They have one mission, and that’s the elimination of unborn children. Margaret Sanger would certainly be proud of the monster she created. Her twisted ideals not only continue to live on today; they’re thriving, with millions of taxpayer dollars making her nightmare a reality.